Likewise with many companies, Regal Entertainment Group is looking to gauge more information about their customer service through the use of an online questionnaire. Below you can discover more details about the Regal Entertainment survey and guideline so that you can thoroughly complete it. Shortened as “REG”, the Regal Entertainment Group runs the 2nd largest theater circuit in the United States. It began with Regal Cinemas in 1989 in Tennessee where their headquarters remain. The company gained more traction after investor Philip Anschutz consolidated Regal Cinemas with two different cinema circuits: United Artists Theaters and Edwards Theaters. The Regal Entertainment survey is a guest satisfaction questionnaire designed by Regal to better understand their customers. It is quick and easy to take as you will see common survey-related questions such as satisfaction ratings and more. There are two ways you can participate in the sweepstakes. You can take the Regal Entertainment survey online, and with that, you will need an invitation from your latest visit. Any online entries have to be received before the last date of that month or it will not count for the sweepstakes. If you want to just enter the sweepstakes, you can do so via mail. Mail-in: If you want to just enter the sweepstakes, you can mail a hand-printed submission with your full name, complete address, phone, birthday, and email to Regal Entertainment Group, 7132 Regal Lane, Knoxville, TN 37918, Attn: Marketing (“Mail-in Entry”). Online: To take the Regal Entertainment survey, head to the questionnaire webpage with your invitation ready. Select “Español if needed. Type in the access code. If you need help finding it, an image is available on the website highlighting the code location. Rate your overall satisfaction with your experience. You will also answer some yes or no questions relating to your visit. Follow through the survey answering all questions honestly. You’ll see specific questions relating to the movie you saw such as the time and day. Near the end, you’ll be asked if you want additional offers and to enter the sweepstakes. If so, add your personal information. You can read up more about the company through their official website, and the questionnaire can be taken on their “Talk to Regal” webpage. To take the Regal Entertainment survey, you must be a legal U.S. resident who is at least 13-years-old or older. It’s void though in Hawaii, Alaska, Puerto Rico, and Maine. Employees along with their immediate family and household members aren’t eligible. 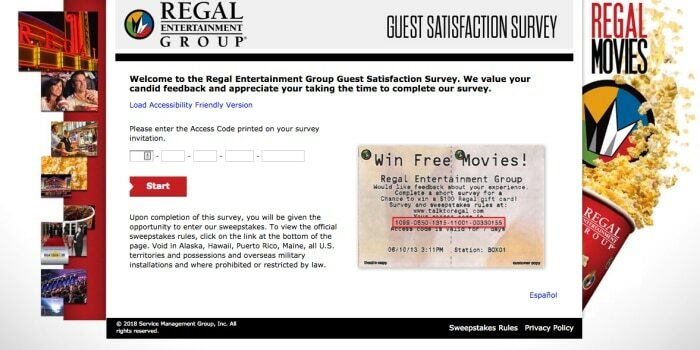 For completing the Regal Entertainment survey, you have the option of gaining an entry to their monthly sweepstakes. There is one prize that consists of a $100 Regal gift card. Hours of operation for Regal locations can differ widely depending on specific theaters and the movies playing. Some open in the afternoon around 1:00PM and remain open until 10:10PM. Others can start earlier at 11:50AM and go until around 9:00PM. Take a look at your local theater to see more specific times. The Regal Entertainment Group has over 7,000 screens across more than 500 theaters. It is simple to locate your nearest Regal location by using their theater locator link on their official webpage. Regal Entertainment offers several ways for you to reach them beyond the survey. You can always call Customer Service at 1-877-TELL-REGAL (1-877-835-5734), option 2. To call corporation, use the following number instead: 1-865-922-1123. If you’re interested in writing to them, you can do so at Regal Entertainment Group, 7132 Regal Lane, Knoxville, TN 37918. There are also a number of online methods you can use to contact the company. For starters, you can fill out their official “Contact Us” page. You can also find them on other websites such as Facebook, Twitter, Instagram, and YouTube.